A new or rather ‘uncertain’ era has begun with Donald Trump assuming the Oval Office. His election rhetorics against outsourcing, immigration, and taxation were not taken well by many. 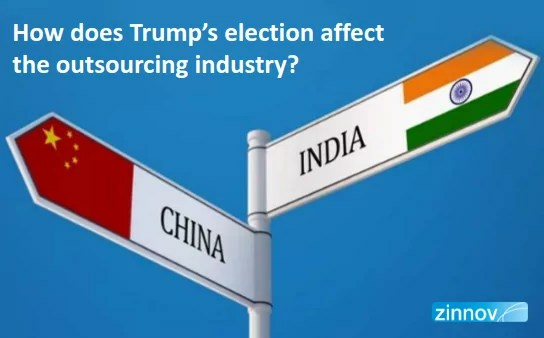 Considering the fact that the US has always been a strong advocate of globalization and free trade, the question that surely arises with the advent of Trump is if, and by how much, will it change the outsourcing landscape, especially for India? Stringent immigration policies: Although the infamous ‘wall’, in all probability will not be built, Trump can be realistically expected to do something to curb immigration — legal or illegal. He was quoted as saying that he would ‘want to scrap the current 65,000 H-1B visas every year’ which hold a significant importance for Indian software companies. Indians constitute a great proportion of those receiving H-1B visas and any move to remove such a visa could have a huge impact on Indian companies and personnel. Making ‘America Great Again’ by getting back all the outsourced jobs: Over 12.3 million Americans are employed in the manufacturing industry and it remains a key part of the U.S. economy. Interestingly, about 5 million manufacturing jobs have been lost in the US over the past 15 years, owing to undercutting by China with its cheap labour. Trump government may now try to get some of the lost manufacturing jobs back to the US by offsetting labour cost advantage with a combination of tariff and non-tariff barriers. Assuming a scenario in which some of these electoral promises come to fruition, wholly or partly, any additional duty on services provided to companies in the US will directly add to costs and hence offset cost benefits provided by outsourcing services and make outsourcing less viable. Also, stringent immigration policies would have an impact on Indian IT companies owing to their dependency on H1B visas. A relatively neutral Obama administration tightened the immigration policy by imposing a special fee of $4000 on certain categories of H1B visas and $4500 on L-1 visas, which is costing Indian IT companies an additional $400 million every year (2). Any action on the proposed changes in the immigration policy, similar or more drastic, would have an adverse impact on the Indian outsourcing industry as a whole. However, with every challenge comes an opportunity and no good challenge should be allowed to go waste. The Indian outsourcing industry has always been overly reliant on North America, with NA bringing up 60% of the $82bn software export revenue for the industry. Growth of India’s outsourcing industry has slowed down from 20% in 2000 to 12% in 2016–17 (forecasted). Clearly, a fresh perspective in the industry has been long overdue and the changes in the US administration should be seen as an opportunity to bring about some much needed changes in the industry. Firstly, increased pressure from the US should further push Indian outsourcing to look for markets elsewhere. Secondly, any change in the scenario should force the industry to make more serious attempts to go to the next orbit of service delivery which is not defined by just labor and cost arbitrage. It will now be imperative for IT services providers to focus lot more aggressively on value addition through digital transformation, setting up delivery centers in low cost talent pockets in the US, acquiring US based technology services & consulting companies and partnering with startup ecosystem to stay relevant in the US technology business. Fourthly, from a geo-political standpoint, the existing dynamics between US, India, Russia, China and Pakistan, places India at a sweet spot for the US as ‘India’ can act as its ‘Trump Card’ to counter China-Pakistan ties. Going by history, a number of US presidential candidates were not considered favourable towards India but the bi-lateral ties between both the countries have spanned out well since Bill Clinton. Finally, it would be worth keeping in mind that during elections, candidates resort to a number of rhetorical claims in order to bag votes, and Donald Trump was no exception. Having said that, Trump himself had changed his stance on immigration quite often during his election campaigns, and this should be seen as a sign of flexibility on his part. The US government machinery has sufficient checks in place to ensure that the policy decisions are well-thought out, and major decisions are not made based on a single person’s point of view. Any extreme views which Trump had propounded may have given him a lot of traction with the US electorate, but their contribution to the ultimate policy creation and decision making will be severely limited by pragamatic concerns of the industry. We do not expect US enterprises to cut down on outsourcing dramatically, though it will be imperative for IT services providers to focus a lot more aggressively on value addition to their clients by moving up the value chain to stay relevant in the US market. Large outsourcers will continue to derive a significant share of revenue from the US market and will attribute the growth to a combination of offshore delivery efficiencies through automation and job creation in the US itself.